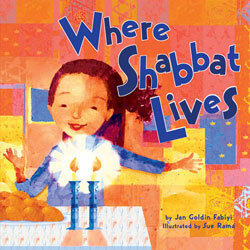 Reviews of Where Shabbat Lives by Jan Goldin Fabiyi, illustrated by Sue Rama (Kar-Ben, 2008), Dinosaur on Shabbat by Diane Levin Rauchwerger, illustrated by Jason Wolff (Kar-Ben, 2006), The Seventh Day by Deborah Bodin Cohen, illustrated by Melanie Hall (Kar-Ben, 2005) and A Mezuzah on the Door by Amy Meltzer, illustrated by Janice Fried (Kar-Ben, 2007). Sometimes we parents are so excited to have Jewish children’s books about something other than Hanukkah that we are less than critical about the quality of the books. In my family, that’s not a problem. With my three little critics listening to me read, I have learned which books work for children of different ages and temperaments, and which don’t. Where Shabbat Lives is a little prose poem that manages to be blissfully general and contentedly specific in almost every instance. Save one, every mention of the specific places and actions “where Shabbat lives” is one that all three of my children can relate to without a moment’s hesitation, even though we don’t manage all of them every week. And even when we are told that Shabbat lives “in our walk to synagogue”–something we never do, as we live nearly seven miles from ours–my children can relate easily on an environmental level. They see the walking described in the book as similar to carpooling. Indeed, the messages of this book are religious in both a practical and a social sense, and they fit perfectly. Shabbat is found equally in our hallah, our guests, our lives and our sharing. This book transitions well from my 4-year-old, who likes the repetitive nature of the “lyric” and the familiarity of the message, to my 6-year-old, who can speculate with me about how Shabbat can be both so familially and externally oriented. My 8-year-old likes it as well, for the familiarity and reassurances of the message. There is only one problem with this book, but it is a large one. The illustrations are uninspired to the point of encouraging a reader to flip quickly though, avoiding the collage-like art in favor of enjoying the words repeatedly. The people appear plastic, their expressions reminiscent of dolls or video games. The backgrounds are a cross between wallpaper and watercolors soaked till they lose most of their tint. The lovely flowers on the family’s Shabbat table are such a shocking contrast, it only enhances the discomfort in what is missing from the bleached out family celebrating Shabbat. I enjoyed this lovely little book and my children did as well, but if Kar-Ben ever reissues it, I hope they spring for all new paintings. The text more than deserves it. It’s odd that a book with as much going for it as The Seventh Day has could feel so very flat. Cohen refers repetitively–in the way of a fairy tale or a children’s song–to G-d as a “like a potter/painter/musician,” and never in gendered language. The illustrations are both colorful and slightly abstract, while nonetheless clearly showing pretty trees, tall mountains, cute panda bears, happy children. The colors are pretty, the story familiar and yet described in a new way. So why did my children read this book with me once and then never ask for it again? Why did I never suggest this as a bedtime book after we went through it that once? Perhaps it is because the art does not capture the heart, and the pretty words do not capture the mind. Far too sophisticated for the 4-year-old, too detailed for the 8-year-old and too detached for the 6-year-old, this book attempts to reach all of my children and fails at every turn. Even my mother disliked it. She said the issue was that it presented a myth as reality. Knowing her as well as I do, however, I feel confident that a better, more engaging presentation would have nullified that objection. She wouldn’t even have thought of it. In the end, this book bored all five of us, and for different reasons. None of us recommend it. Our preschool sings a song every Friday about the “dinosaur, knocking at my door!” who wants to spend Shabbat with all of us, lighting candles, drinking wine and eating hallah. And so Dinosaur on Shabbat came pre-approved and in context for both of my daughters, who loved this book from the moment they saw the dinosaur and the little boy braiding hallah dough on the cover. The illustrations are simple, friendly, colorful and attractive. The rhymes are easy and sweet, never feeling forced. The dinosaur and the little boy who joyfully welcomes him are consistent, engaging and fun to look at. The book is heavy on cool blues and greens, which could be a simple soothing technique for over-excited children who ought to go to sleep already, but it does get a bit heavy-handed after a few pages. Still, the illustrations are a good fit for the text and enjoyable to see. The text is lovely. In this book it is the dinosaur who makes all the mistakes, and the child who gets to correct him gently. But most of the dinosaur’s actions are perfectly appropriate. It is clear that their dinosaur guest loves Shabbat, and that Shabbat is a great day to love. Just pulling this one out gets both my 4-year-old and 6-year-old singing. My 4-year-old frequently chooses this as the book to “read” to us. Are there more rousing endorsements? 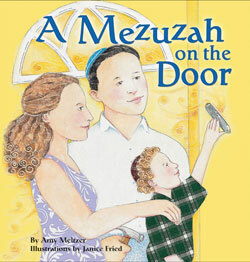 The only real storybook in the pile, A Mezuzah on the Door, is charming, informative and clear. The colorful, detailed illustrations are utterly gorgeous and more than worth lingering over. And my 6-year-old was inspired to discuss it as we read, to ask questions and to make comments regarding the story and the message. Noah and his parents have moved from the big city to a new house in the suburbs. A place that is both everything that his parents promised, and nonetheless too quiet (and lonely) for Noah to enjoy. This manifests as the inability to sleep. Since my then 13-month-old son had this exact reaction when we moved from an apartment to a house years ago, I found the book realistic in addition to all of its other virtues. Noah’s parents choose to invite all of their much-missed former (and most charmingly human) neighbors to a mezuzah-hanging party. This allows the authors to explain mezuzot, Hanukkah, etc., in positive, age-appropriate language that worked perfectly for both my 6- and 8-year-old children. The authors touch on Hanukkah because the celebration and dedication of the new home is called a Hanukkat Habayit, and Noah doesn’t know the term any more than I did. Several explanations are given for the custom of touching/kissing a mezuzah upon entering a building. Each is more charming and resonant than the last. The party, the mezuzot on his home and bedroom doors and the opportunity to see much-loved old friends and neighbors, and therefore connect his new and old lives, allows Noah the opportunity to reintegrate, feel more Jewishly and communally connected, and finally get a good night’s sleep in his new suburban home. The book closes with a short, helpful introduction to mezuzot and how to properly hang them. Then it gives the prayer in Hebrew, transliterated English and English. This makes the storybook a good reference and an obvious choice as gift for any family raising Jewish children that is moving to a new home. Vicki Streiff married a convert to Judaism in 1995 and they have three children who all love books. They all live together in Indiana and love it there, to her everlasting surprise.